From the days of Morris Sigel to the unprecedented success of Paul Boesch, the story of Houston wrestling is fascinating for not only its importance to the NWA, but also the sheer length of its reign and influence. The Texas powerhouse promotion had no equal in the Lone Star State, and its might yielded both prosperity and controversy. The territory saw gates that crushed those of the other Texas promotions. It was center stage for the Funk/Brisco family feud, hosting the switch of the NWA title to Jack Brisco. 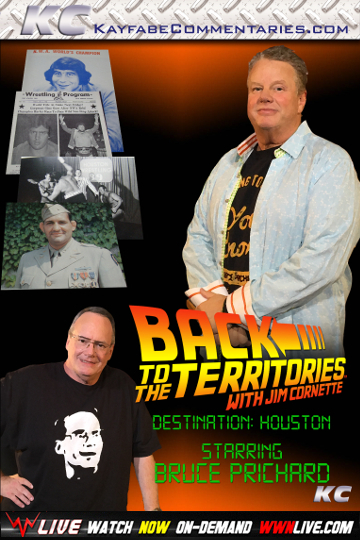 Join Bruce Prichard and Jim Cornette as they dissect everything possible about the classic territory. Bruce was a young acolyte, cutting his teeth in the territory and his closeness to Boesch and the entire operation put him front and center for much of what is discussed. Get in and head BACK IN TIME once again!!! Please note that this purchase is for a Video on Demand product viewable only at WWNLive.com or the WWN Roku Channel.